Which Background/Boarder colour do you prefer? Now don't get alarmed by the title of this topic. 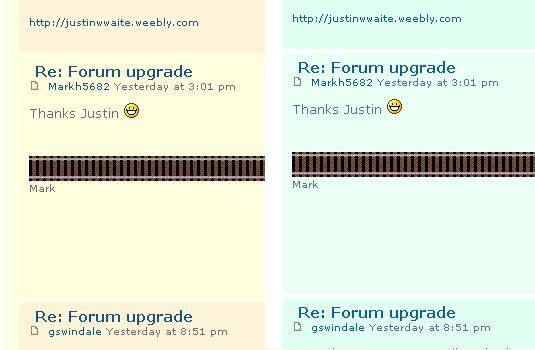 It is just that I have found out where in the Admin panel to adjust the individual colour scheme for the forum. I will be tinkering with it till I get something that is less generic and more suitable over the next few days. So if you see somethings change a few times during your visits don't panic, it will be me fiddling around. Nice shade of Brunswick green border is most suitable. You could also have opted for Crimson Lake. Still toying around, trying to see what suits best. The Brunswick green for the main colour was too dark, I kept it as the boarders though. Truth is rarely pure, and never simple. Well what about the 'headboard'? I think it's kinda wonky? Unless there are objections, I am thinking about 'locking in' the new colour scheme. Any body with bad eyesight let me know. If any one cn make the headboard look better (ie real) please let me know and I will put yours up. Like the new colour scheme but one ctiticism, black print does not show very well against green background. Thanks for the feedback on the colours guys. Still trying to work this lot out. For those who are wondering, the outer boarders are in early Brunswick Green, the inner borders are Doncaster Apple green, the main text area is the A4's silver, the link text is Southern 'sunshine' yellow, the main text is Pullman Cream, the rollover is GWR lining signal red. The colour of my 'call sign' is LMS Crimson Lake. I still have some tweaking to do so look out for more 'famous' colours. I don't know exactly what you did, but if you highlight the text then select the colour button and choose the colour it seems to come out fine. Well at least it did on mine, does anyone else have any issues? I know it is only early days yet, but is there any chance of adding a selection of board themes (colour schemes) to the user preferences, so that users can set their preferred colour scheme as their own default, especially as some of us are not as young as we were and may have difficulty reading the posts, as I have with the current colours. Mark, I'll look into that. Still working out all the kinks and secrets of this forum. My only comment regarding the header area is that with the headboard & all the large images, coupled with the advertising bar; we have used up half the screen already before actually getting to the good stuff. Untill I sort out some bugs in the forum, we are going back to the 'defult colours' for a bit. I will update this post shortly with colour checks. Edit 1: I just had a moment, I had both this forum in 'defult colours' open and UKTS at the same time. I got confused as to which one was which becasue I couldn't see the logos! Edit 2: Ok, working on fixing the 'Green Scheme', I have one question: is the major problem the Cream on Green text or the Cream on Silver Grey? I have a trail version going on that doesn't affect the main site but lacks all the alignment abilities of the main area. I'm just trying to see which of the groups of colours people are having trouble with. Below are some samples to see which is easier to read. The main problem is the text that is out side the forum posts is the same colour inside, you can't seperate them. Geoffrey, I will try and create smaller icons and rearange the header area so less space is taken. Edit 3: Ok I have both the Defult style and the Green scheme fully set up, just waiting on feed back on the text colour. The only other problem is I can't enbale user choice for colour schemes. Still trying to sort that one out. A dark text against a very light background is much easier to read than vice versa which can be hard on the eyes. I don't know what colours you have available to you, but I took a screenshot and mucked around with the colours a bit so that they are still easy to read but different enough from the UKTS colours as to be able to distinguish between the two, here are a couple of examples, see what you think. I can use any variation on colours, the host site has the ability to coustom generate the colour to match. Here is a trial of a modified BR blue/grey with a bit of Pullman sream in the mix. This is the problem i'm getting, explained better than last night. Tried turning off my anti-virus in case thats blocking the link, but no joy. 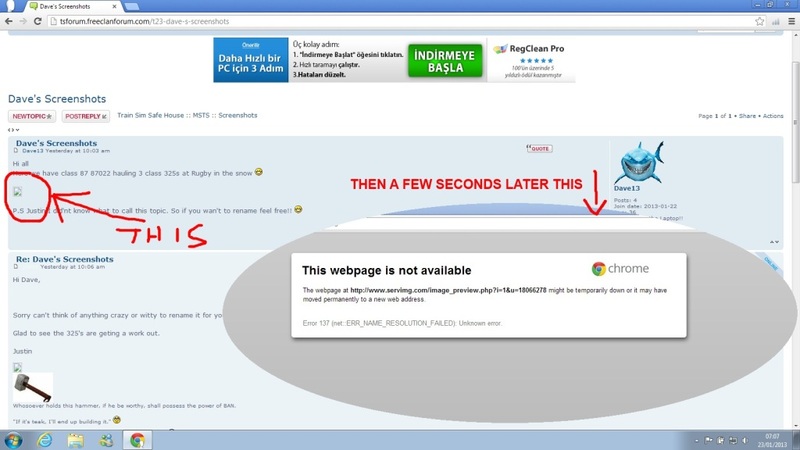 The image is hosted on www.servimg.com, the site may have gone down for a bit when you tried to view the forum. It could have also been caused by me working on the site. I will try to leave the site alone upgrade wise of a few days to see if this was the problem. Although that seems unlikely as I have chrome on my tablet computer and it works fine. By the way my internet connection is having issues so some times this site flicks back to the greens whilst I'm working on it. I just have one more quick thing that I want to do then I shall leave it alone to see if people prefer the BR Blue/Grey. The only other version I will try is the same as this one but with Pullman Umber borders instead. I have taken Mark's ideas on board and have gone for lighter backgrounds behind the text. Are there any issues with reading text on the current colours? I'm happy with the current scheme. I'll leave it as these colours for a while. I have done two other version, only difference is the boarder colour has been changed. One being Brunswick Green and the other is Pullman Umber. I will give each of the three versions ago and see which one people like best. You'll probably get sick and tired of the colour changes. Regards google chrome I use it and don't have the problems Clive is having. What about LNER lettering like on teak sets for the slogen A 'Safe Haven for wiser minds in the train sim community. The current colours are fine, and the text is easy to read. No problems viewing the site with Chrome here either. That is just a rough edit, it would need a lot of tidying up (or re-doing properly). I was feeling bored so I had another fiddle around. I like them all except BR sign of indecision one,that was the nick name at the time when BR bought out the double arrow logo. Wow some great ideas are coming out. I like the hotdog and the BR totems, they may make their way onto some customised items that I have planned for the future (rolling stock, station signs). That is also why I went for a headboard for the forum logo. Mike, about the BR "arrows of indecision" one, I don't know. I'm in two frames of mind over it. Maybe they all could go somewhere on my evolving route idea. One comment from me on the forum and that is that the font used is too big. Is there any way to reduce the size of this? I like this font size as my eye sight is not as good as it used to be,and some of the smaller sizes I have dificulty reading. If you don't mind me asking, what is your screen size? I have a 23" one and the font is quite ok. I don't have to sit close to the screen as I do on some sites to read what it says. When I uped the size I went from 12 to 16. Perhaps a compromise at 14 could be reached?